It is now time to celebrate the true instrumentalist in Mary Halvorson playing her guitar in solitary splendour. To celebrate her stature as she plays standards by modern masters she seems to have chosen charts recognisable for the brevity of their titles but played not played merely by stabbing at the melody. And the guitarist shines in an extraordinary manner, in this incomparable, if savagely daunting repertoire that tests the lengths to which she will go to arrive at a new standard. 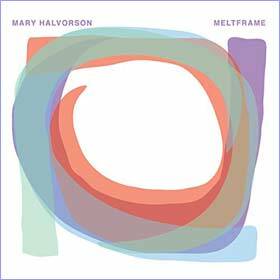 As Meltframe shows Ms. Halvorson has not only complete mastery of her instrument, but also presses it into tireless exploration reminding us constantly of her ability to use dynamics to express deeply felt emotion and a romantic – not sentimental – notion of music complemented by poetic subtlety and finesse. As a group these pieces are richly embellished with ornaments, divisions and chords (made possible by bespoke tuning). The recording is a considerable achievement by any standard. 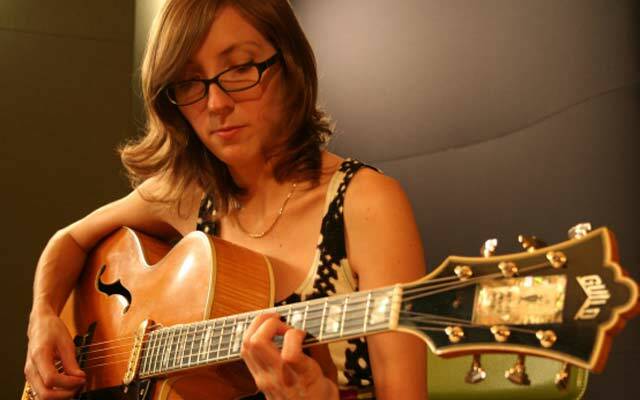 Mary Halvorson plays cleanly, her warm tone resonantly captured here. Her command of ornamentation is impressive. Intonation never falters. Ms. Halvorson is at home in the treble as well as the bass registers of the instrument. In “Aisha” and in “Platform” she traverses the gamut of her instrument, balancing the tune and its accompaniment, while in “Sadness” her elemental melancholy suggests intricate bariolage and in “Solitude” – yes the Duke Ellington song – there is the equally sad sound of fluttering wings – echoes of departing joy. These are exceptional moments in the playing of an instrument by itself – and instrument – and Ms. Halvorson’s remarkable handling of these pieces brings them truly to life. Her great hierarchal approach to each tune makes each stand out on its own merit. Her chords are sensational and enrich the musical textures existentially and her bass notes drive harmony more effectively. In addition there is great dynamic shading within phrases and textures. All of this keeps the story front and centre and gives meaning to the essential characteristics of the song. In the grander scheme of things, Mary Halvorson strikes an unerring balance and sense and sensibility provides a strong reference to the searing intensity of say Sonny Sharrock. It is also clear that Ms. Halvorson is enchanted by pure sound – irrespective of what instrument she is playing. She could be playing a piano, for that matter or even an instrument of indeterminate pitch. Her exploration of the music and its sound as interpreted by the guitar are equally important as compared to melody, harmony and rhythm. The latter is something few people recognise in a guitarist unless she is deliberately indulging in timekeeping. With Mary Halvorson, all of this comes together in a congruent whole. Lest I forget this is a well-recorded disc, with attention payed to balance, the crispness of sound and its delivery through the digital format. In many ways, the recording is reminiscent of the analogue experience, few engineers are able to accomplish in the digital realm. Track List: Cascades; Blood; Cheshire Hotel; Sadness; Solitude; Ida Lupino; Aisha; Platform; When; Leola.